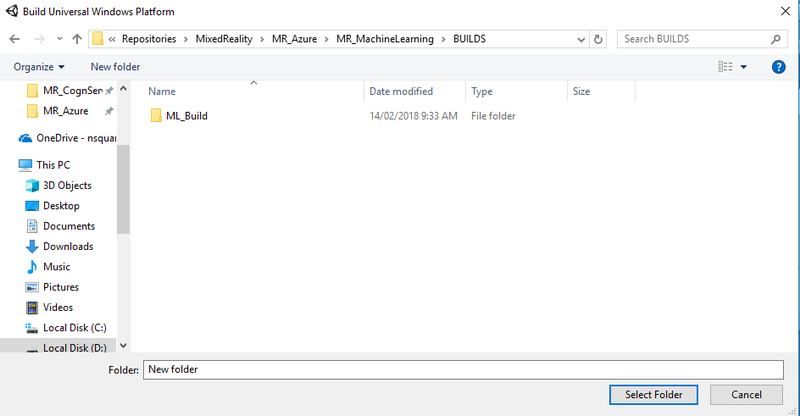 In this course, you will learn how to add Machine Learning (ML) capabilities to a mixed reality application using Azure Machine Learning Studio. 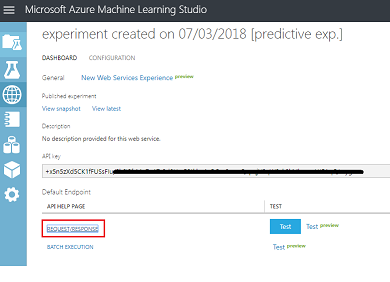 Azure Machine Learning Studio is a Microsoft service, which provides developers with a large number of machine learning algorithms, which can help with data input, output, preparation, and visualization. From these components, it is then possible to develop a predictive analytics experiment, iterate on it, and use it to train your model. 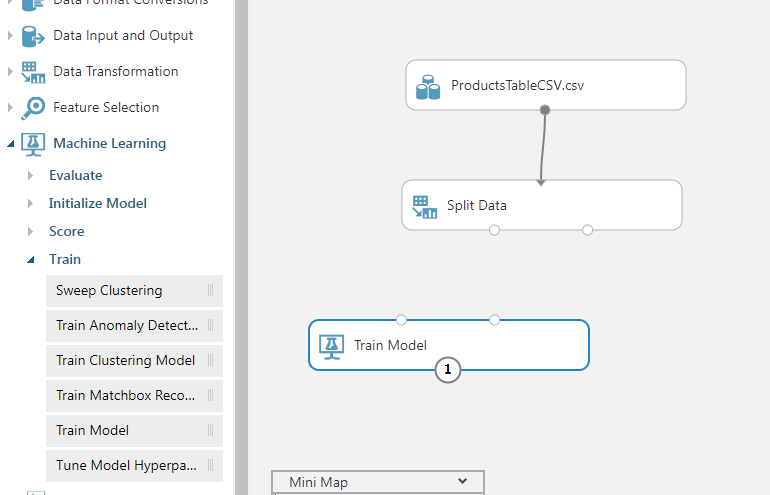 Following training, you can make your model operational within the Azure cloud, so that it can then score new data. For more information, visit the Azure Machine Learning Studio page. 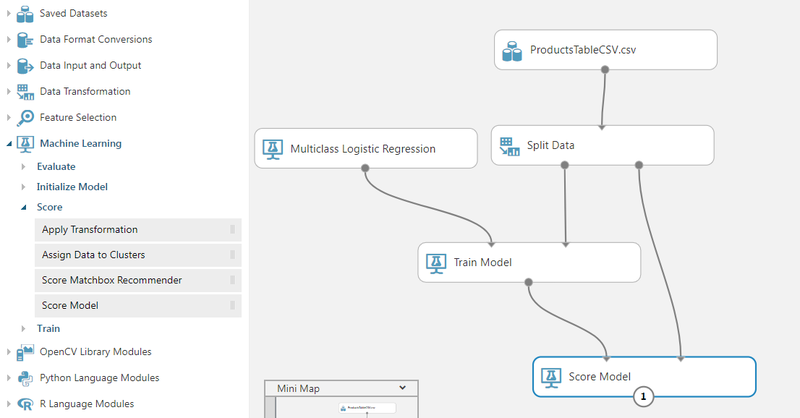 Provide a table of sales data to the Azure Machine Learning Studio portal, and design an algorithm to predict future sales of popular items. 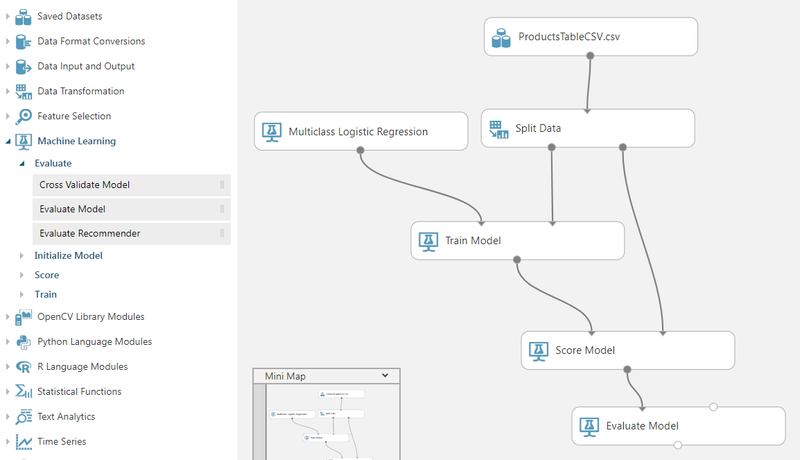 Create a Unity Project, which can receive and interpret prediction data from the ML service. 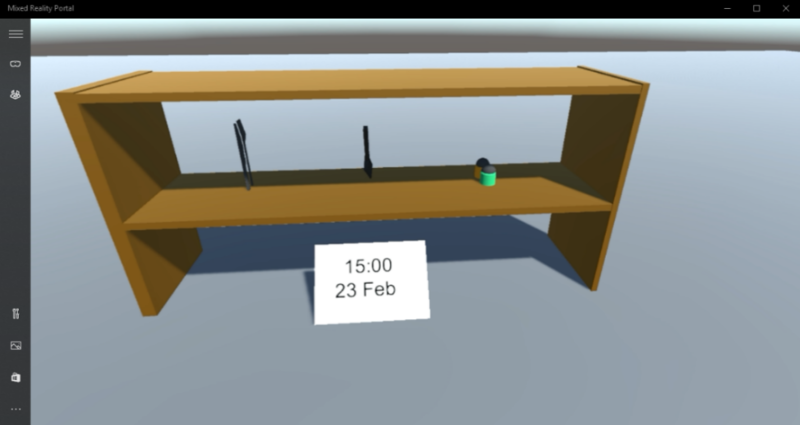 Display the predication data visually within the Unity Project, through providing the most popular sales items, on a shelf. This course is a self-contained tutorial, which does not directly involve any other Mixed Reality Labs. Once you are logged in, click on Storage Accounts in the left menu. On the Storage Accounts tab, click on Add. Insert a Name for your account, be aware this field only accepts numbers, and lowercase letters. For Deployment model, select Resource manager. For Account kind, select Storage (general purpose v1). For Replication select Read-access-geo-redundant storage (RA-GRS). Leave Secure transfer required as Disabled. 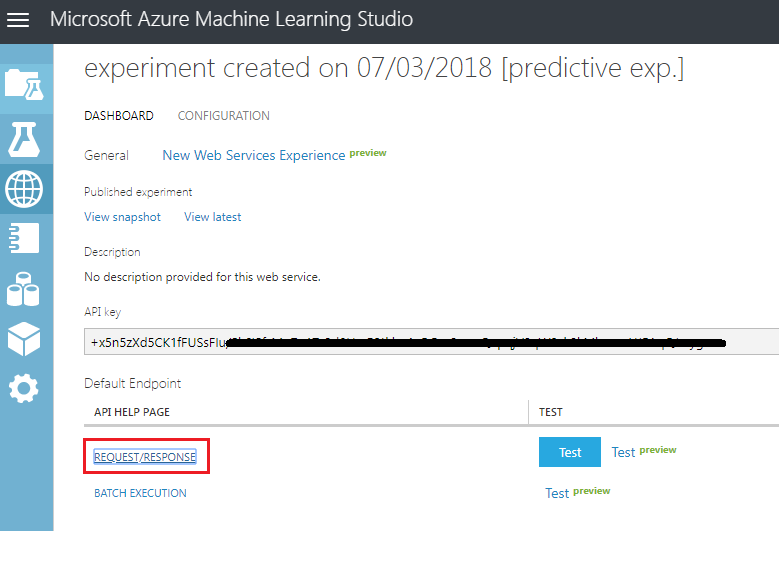 To use the Azure Machine Learning, you will need to configure an instance of the Machine Learning service to be made available to your application. 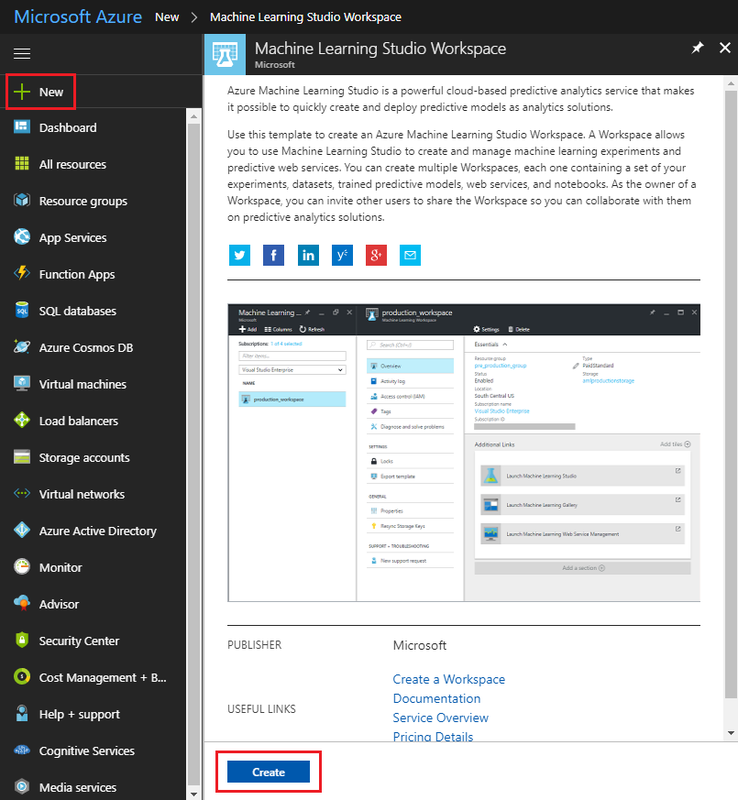 In the Azure Portal, click on New in the top left corner, and search for Machine Learning Studio Workspace, press Enter. 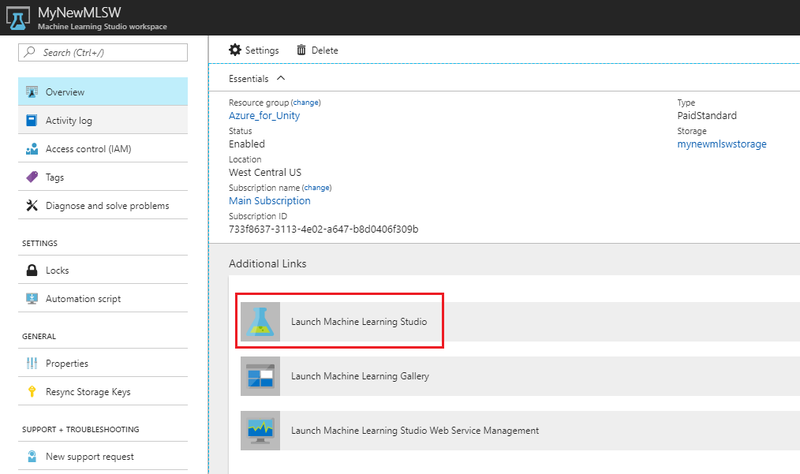 The new page will provide a description of the Machine Learning Studio Workspace service. At the bottom left of this prompt, click the Create button, to create an association with this service. Insert your desired Workspace name for this service instance. Determine the Location for your resource group (if you are creating a new Resource Group). The location would ideally be in the region where the application would run. Some Azure assets are only available in certain regions. You should use the same resource group that you used for creating the Azure Storage in the previous Chapter. 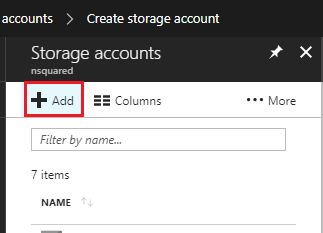 For the Storage account section, click Use existing, then click the dropdown menu, and from there, click the Storage Account you created in the last Chapter. Select the appropriate Workspace pricing tier for you, from the dropdown menu. Within the Web service plan section, click Create new, then insert a name for it in the text field. From the Web service plan pricing tier section, select the price tier of your choice. A development testing tier called DEVTEST Standard should be available to you at no charge. In the page displayed, under the Additional Links section, click Launch Machine Learning Studio, which will direct your browser to the Machine Learning Studio portal. Use the Sign In button, at the top right or in the center, to log into your Machine Learning Studio. One of the ways Machine Learning algorithms work is by analyzing existing data and then attempting to predict future results based on the existing data set. This generally means that the more existing data you have, the better the algorithm will be at predicting future results. A sample table is provided to you, for this course, called ProductsTableCSV and can be downloaded here. The above .zip file contains both the ProductsTableCSV and the .unitypackage, which you will need in Chapter 6. This package is also provided within that Chapter, though separate to the csv file. This sample data set contains a record of the best-selling objects at every hour of each day of the year 2017. For example, on day 1 of 2017, at 1pm (hour 13), the best-selling item was salt and pepper. This sample table contains 9998 entries. Head back to the Machine Learning Studio portal, and add this table as a Dataset for your ML. Do this by clicking the + New button in the bottom left corner of the screen. A section will come up from the bottom, and within that there is navigation panel on the left. Click Dataset, then to the right of that, From Local File. 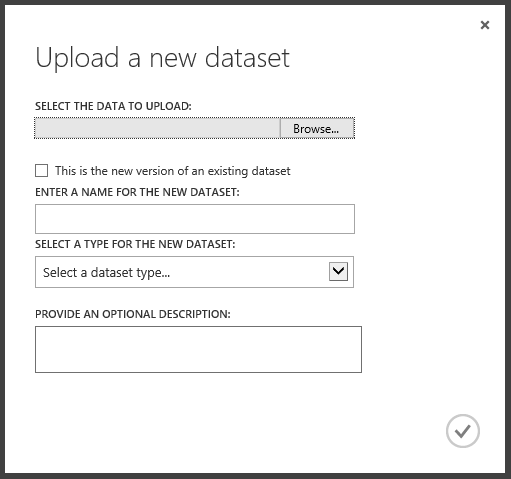 The upload window will appear, where you can Browse your hard drive for the new dataset. Once selected, and back in the upload window, leave the checkbox unticked. 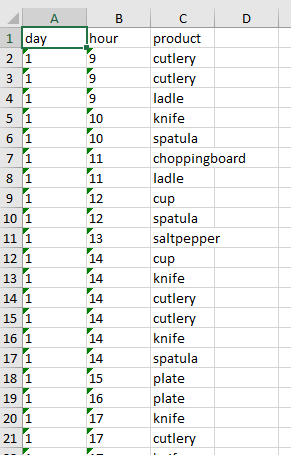 In the text field below, enter ProductsTableCSV.csv as the name for the dataset (though should automatically be added). Using the dropdown menu for Type, select Generic CSV File with a header (.csv). Press the tick in the bottom right of the upload window, and your Dataset will be uploaded. Before you can build your machine learning system, you will need to build an experiment, to validate your theory about your data. With the results, you will know whether you need more data, or if there is no correlation between the data and a possible outcome. Click again on the + New button on the bottom left of the page, then click on Experiment > Blank Experiment. From the panel on the left expand Saved Datasets > My Datasets and drag the ProductsTableCSV on to the Experiment Canvas. In the panel on the left, expand Data Transformation > Sample and Split. 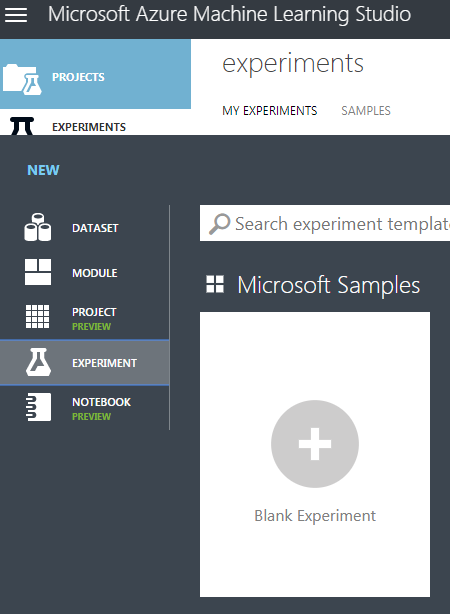 Then drag the Split Data item in to the Experiment Canvas. The Split Data item will split the data set into two parts. One part you will use for training the machine learning algorithm. The second part will be used to evaluate the accuracy of the algorithm generated. In the right panel (while the Split Data item on the canvas is selected), edit the Fraction of rows in the first output dataset to 0.7. This will split the data into two parts, the first part will be 70% of the data, and the second part will be the remaining 30%. 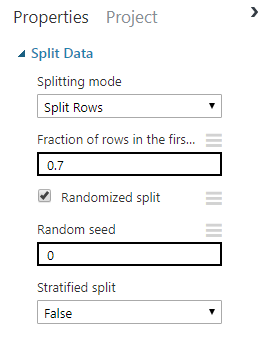 To ensure that the data is split randomly, make sure the Randomized split checkbox remains checked. 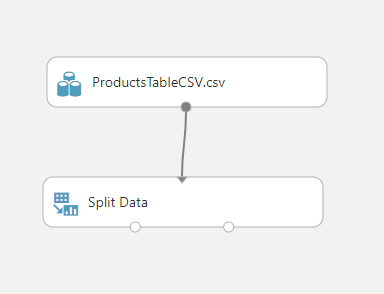 Drag a connection from the base of the ProductsTableCSV item on the canvas to the top of the Split Data item. This will connect the items and send the ProductsTableCSV dataset output (the data) to the Split Data input. In the Experiments panel on the left side, expand Machine Learning > Train. Drag the Train Model item out in to the Experiment canvas. Your canvas should look the same as the below. 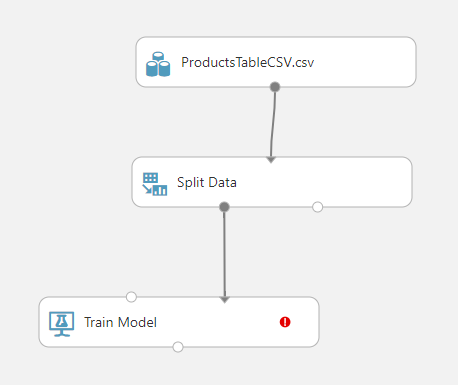 From the bottom left of the Split Data item drag a connection to the top right of the Train Model item. The first 70% split from the dataset will be used by the Train Model to train the algorithm. Select the Train Model item on the canvas, and in the Properties panel (on the right-hand side of your browser window) click the Launch column selector button. In the text box type product and then press Enter, product will be set as a column to train predictions. Following this, click on the tick in the bottom-right corner to close the selection dialog. 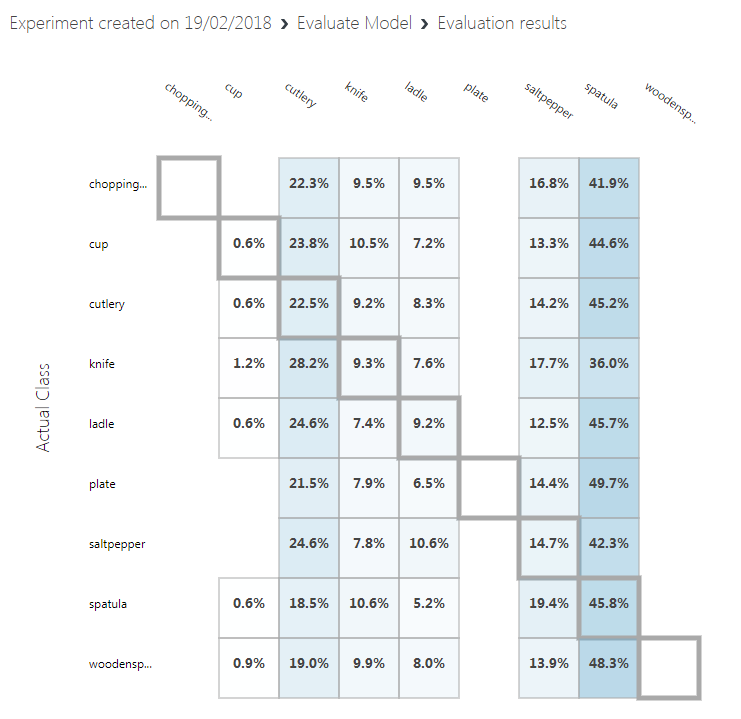 From the experiment items panel on the left, expand Machine Learning > Initialize Model > Classification, and drag the Multiclass Logistic Regression item on to the experiment canvas. Connect the output, from the bottom of the Multiclass Logistic Regression, to the top-left input of the Train Model item. In list of experiment items in the panel on the left, expand Machine Learning > Score, and drag the Score Model item on to the canvas. Connect the output, from the bottom of the Train Model, to the top-left input of the Score Model. Connect the bottom-right output from Split Data, to the top-right input of the Score Model item. In the list of Experiment items in the panel on the left, expand Machine Learning > Evaluate, and drag the Evaluate Model item onto the canvas. Connect the output from the Score Model to the top-left input of the Evaluate Model. You have built your first Machine Learning Experiment. You can now save and run the experiment. In the menu at the bottom of the page, click on the Save button to save your experiment and then click Run to the start the experiment. You can see the status of the experiment in the top-right of the canvas. Wait a few moments for the experiment to finish. If you have a big (real world) dataset it is likely that the experiment could take hours to run. 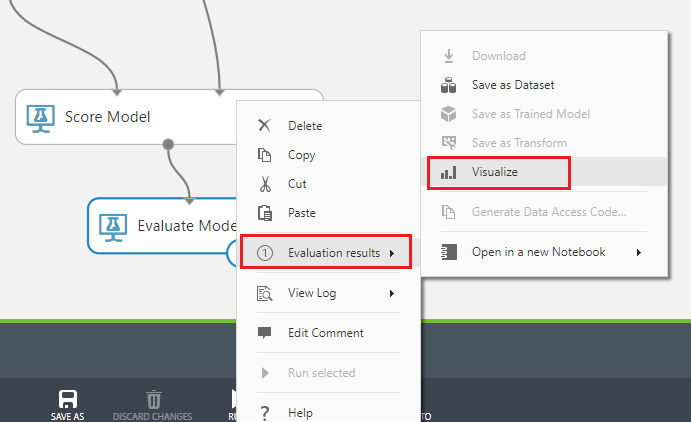 Right click on the Evaluate Model item in the canvas and from the context menu hover the mouse over Evaluation Results, then select Visualize. The evaluation results will be displayed showing the predicted outcomes versus the actual outcomes. This uses the 30% of the original dataset, that was split earlier, for evaluating the model. You can see the results are not great, ideally you would have the highest number in each row be the highlighted item in the columns. To use your newly trained Machine Learning model you need to expose it as a Web Service. To do this, click on the Set Up Web Service menu item in the menu at the bottom of the page, and click on Predictive Web Service. A new tab will be created, and the train model merged to create the new web service. In the menu at the bottom of the page click Save, then click Run. You will see the status updated in the top-right corner of the experiment canvas. Once it has finished running, a Deploy Web Service button will appear at the bottom of the page. You are ready to deploy the web service. Click Deploy Web Service (Classic) in the menu at the bottom of the page. Your browser may prompt to allow a pop-up, which you should allow, though you may need to press Deploy Web Service again, if the deploy page does not show. Once the Experiment has been created you will be redirected to a Dashboard page where you will have your API Key displayed. Copy it into a notepad for the moment, you will need it in your code very soon. 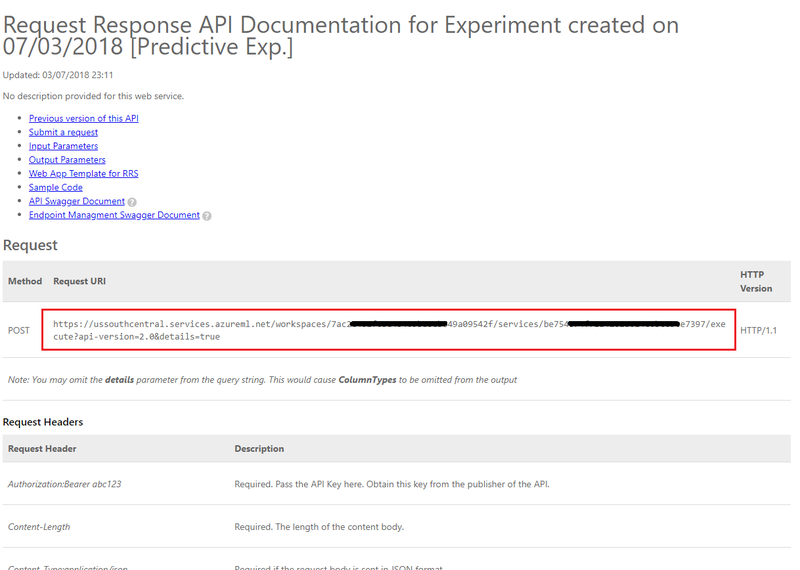 Once you have noted your API Key, click on the REQUEST/RESPONSE button in the Default Endpoint section underneath the Key. If you click Test in this page, you will be able to enter input data and view the output. Enter the day and hour. Leave the product entry blank. Then click the Confirm button. The output on the bottom of the page will show the JSON representing the likelihood of each product being the choice. A new web page will open up, displaying the instructions and some examples about the Request structure required by the Machine Learning Studio. Copy the Request URI displayed in this page, into your notepad. You have now built a machine learning system that provides the most likely product to be sold based on historical purchasing data, correlated with the time of the day and day of the year. To call the web service, you will need the URL for the service endpoint and an API Key for the service. Click on the Consume tab, from the top menu. The Consumption Info page will display the information you will need to call the web service from your code. Take a copy of the Primary Key and the Request-Response URL. You will need these in the next Chapter. You will not require Motion Controllers for this course. If you need support setting up the Immersive Headset, please click HERE. Open Unity and create a new Unity Project called MR_MachineLearning. Make sure the project type is set to 3D. Build Type is set to D3D. SDK is set to Latest installed. Visual Studio Version is set to Latest installed. Build and Run is set to Local Machine. Do not worry about setting up Scenes right now, as these are provided later. The remaining settings should be left as default for now. Save your Project (FILE > SAVE PROJECT). For this course, you will need to download a Unity Asset Package called Azure-MR-307.unitypackage. This package comes complete with a scene, with all objects in that prebuilt, so you can focus on getting it all working. The ShelfKeeper script is provided, though only holds the public variables, for the purpose of scene setup structure. You will need to do all other sections. With the Unity dashboard in front of you, click on Assets in the menu at the top of the screen, then click on Import Package, Custom Package. Use the file picker to select the Azure-MR-307.unitypackage package and click Open. A list of components for this asset will be displayed to you. Confirm the import by clicking Import. Once it has finished importing, you will notice that some new folders have appeared in your Unity Project Panel. Those are the 3D models and the respective materials that are part of the pre-made scene you will work on. You will write the majority of the code in this course. Within the Project Panel folder, click on the Scenes folder and double click on the scene inside (called MR_MachineLearningScene). The scene will open (see image below). If the red diamonds are missing, simply click the Gizmos button, at the top right of the Game Panel. To leverage the use of JSON libraries (used for serializing and deserializing), a Newtonsoft DLL has been implemented with the package you brought in. The library should have the correct configuration, though it is worth checking (particularly if you are having issues with code not working). 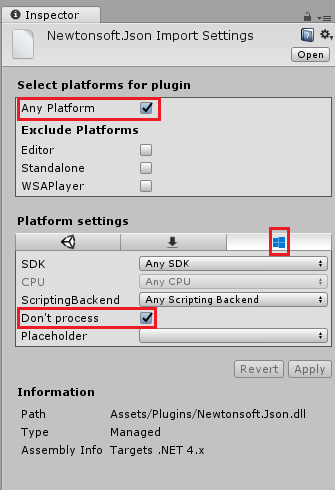 Left-click on the Newtonsoft file inside the Plugins folder and look at the Inspector panel. Make sure Any Platform is ticked. Go to the UWP tab and also ensure Don't process is ticked. The ShelfKeeper class hosts methods that control the UI and products spawned in the scene. Double click on the ShelfKeeper script, within the Scripts folder, to open it with Visual Studio 2017. Replace all the code existing in the script with the following code, which sets the time and date and has a method to show a product. Open the Spawn Point array within the ShelfKeeper component script by left-clicking it. A sub-section will appear called Size, which indicates the size of the array. Type 3 into the textbox next to Size and press Enter, and three slots will be created beneath. Within the Hierarchy expand the Time Display object (by left-clicking the arrow beside it). Next click the Main Camera from within the Hierarchy, so that the Inspector shows its information. 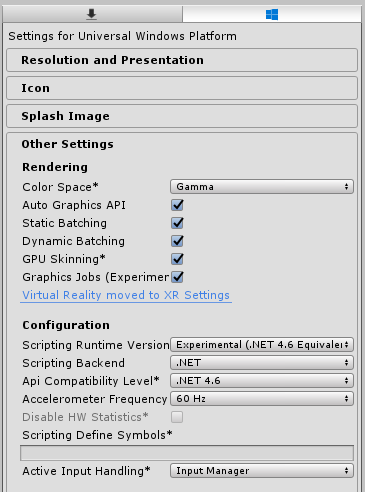 Select the Main Camera in the Hierarchy Panel. 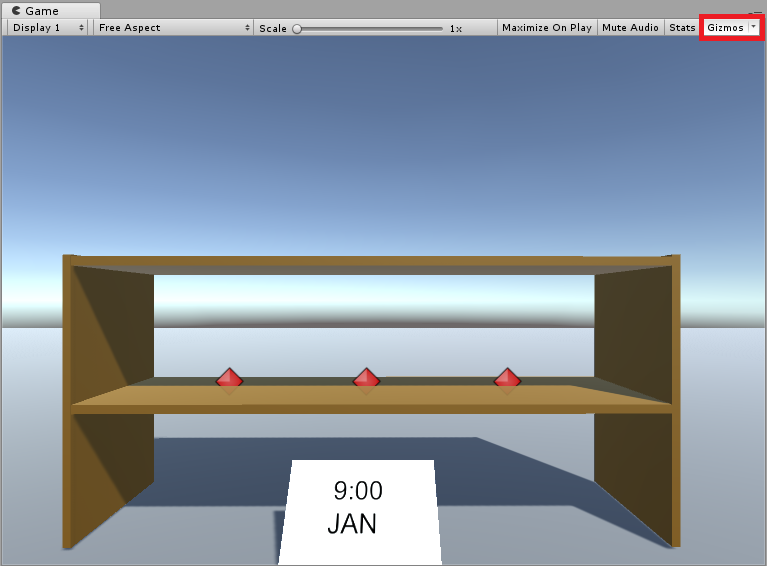 Drag the Date and Time objects from the Hierarchy Panel to the Date Text and Time Text slots within the Inspector of the Main Camera in the ShelfKeeper component. Drag the Spawn Points from the Hierarchy Panel (beneath the Shelf object) to the 3 Element reference targets beneath the Spawn Point array, as shown in the image. The next class you are going to create is the ProductPrediction class. Querying the Machine Learning Service instance, providing the current date and time. Deserializing the JSON response into usable data. Interpreting the data, retrieving the 3 recommended products. Calling the ShelfKeeper class methods to display the data in the Scene. Go to the Scripts folder, in the Project Panel. Right-click inside the folder, Create > C# Script. Call the script ProductPrediction. 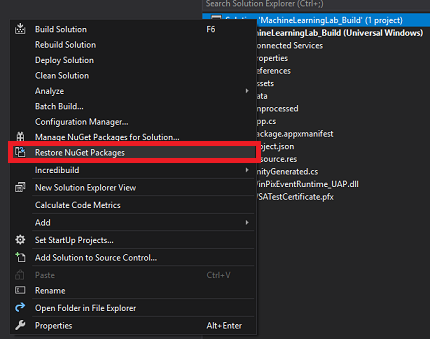 Double click on the new ProductPrediction script to open it with Visual Studio 2017. If the File Modification Detected dialog pops up, click *Reload Solution. Inside the ProductPrediction class insert the following two objects which are composed of a number of nested classes. These classes are used to serialize and deserialize the JSON for the Machine Learning Service. Make sure to insert the primary key and request-response endpoint, from the Machine Learning Portal, into the variables here. The below images show where you would have taken the key and endpoint from. The following is the method that collects the date and time from Windows and converts it into a format that our Machine Learning Experiment can use to compare with the data stored in the table. Add the following method which will communicate the current date and time to the Machine Learning endpoint and receive a response in JSON format. Add the following method, which is responsible for deserializing the JSON response, and communicating the result of the deserialization to the ShelfKeeper class. This result will be the names of the three items predicted to sell the most at current date and time. Insert the code below into the ProductPrediction class, below the previous method. 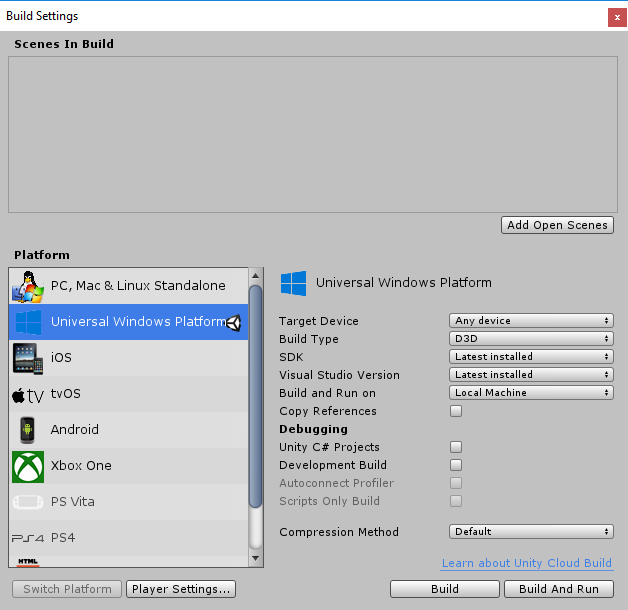 Save Visual Studio and head back to Unity. Drag the ProductPrediction class script from the Script folder, onto the Main Camera object. 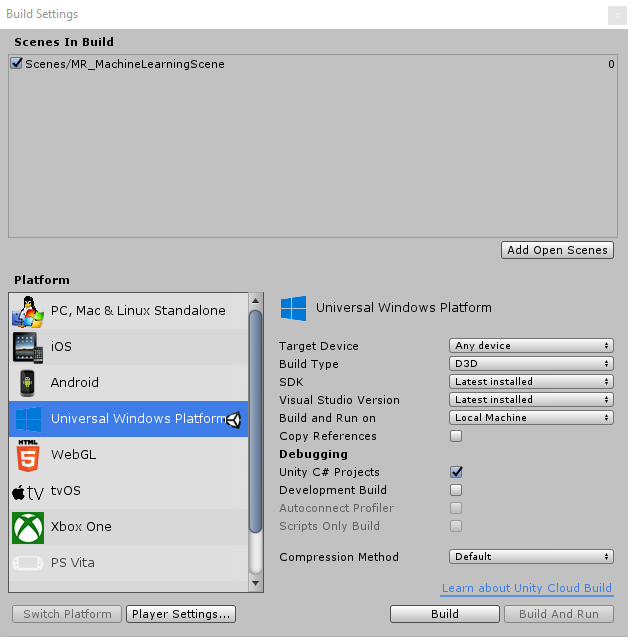 It is now time to build your project as a UWP solution, so that it can run as a standalone application. Save the current scene by clicking on File Save Scenes. Check the box called Unity C# Projects (this is important because it will allow you to edit the classes after build is completed). You will be prompted to select the folder where you want to build the Solution. 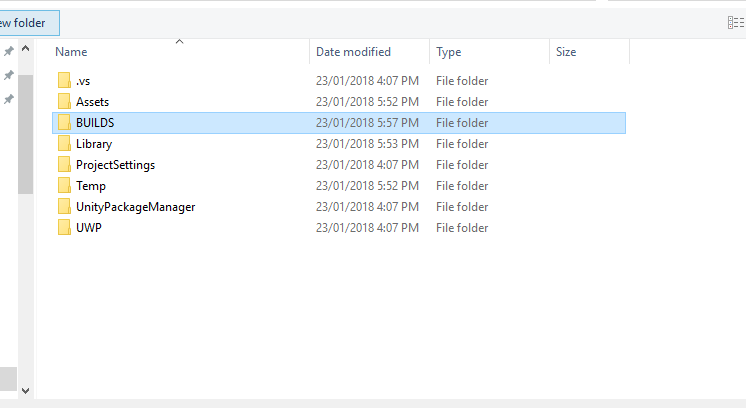 Create a BUILDS folder and within that folder create another folder with an appropriate name of your choice. Click your new folder and then click Select Folder, to begin the build at that location. When you run the Mixed Reality application, you will see the bench that was set up in your Unity scene, and from initialization, the data you set up within Azure will be fetched. The data will be deserialized within your application, and the three top results for your current date and time will be provided visually, as three models on the bench. Congratulations, you built a mixed reality app that leverages the Azure Machine Learning to make data predictions and display it on your scene. Experiment with the sort order of your application and have the three bottom predictions appear on the shelf, as this data would potentially be useful also. Using Azure Tables populate a new table with weather information and create a new experiment using the data.